WASHINGTON – The poisoning of Flint, Michigan’s drinking water may have fallen off newspapers’ front pages and television screens, but residents are asking those concerned about the fallout and the effects on the city’s almost 100,000 residents to not forget them. Several Flint residents were among a slate of panelists who discussed the on-going crisis at the historic Metropolitan AME Church in downtown Washington, D.C. at a national town hall meeting. 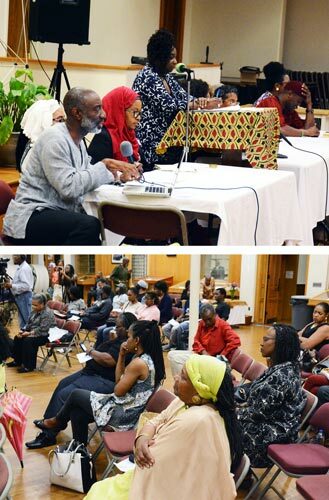 In addition to presenting the roots of the tragedy, panelists spoke about the strategies and plans either being considered or already underway and tied the lead poisoning to cities and communities across the country. “Some people call it an emergency or a crisis, some call it a disaster, others say put yellow tape around the city,” said community activist Yvonne Lewis, who has lived in Flint for 40 years. “I can’t share with you everything everybody feels. The disaster is framed as a poor, Black, African American issue but every one of every race has been affected,” she said. 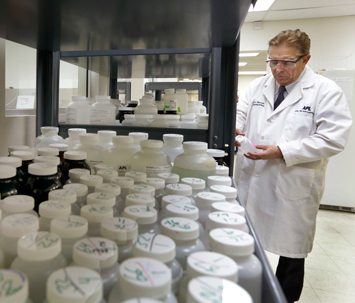 In this, March 25, photo, Robert Barrett, president & CEO of Aqua Pro-Tech Laboratories, in Fairfield, N. J., examines some drinking water test samples at the facility. Responding to the crisis in Flint, Michigan, school officials across the country are testing for lead in the water flowing from classroom sinks and cafeteria faucets to reassure anxious parents or take action if they are surprised by the results. In March, the school district in Newark, New Jersey, shut off sinks and fountains in 30 buildings in response to high lead samples while offering to test as many as 17,000 children for lead contamination. For more than a year, Michigan Governor Rick Snyder and state officials delayed, ignored and stonewalled as complaints from frustrated and concerned Flint, Michigan residents mounted. Ms. Deloney said Michigan state officials formed the group called Resiliency Group which had no water officials or community or grassroots organizations. She said she publicly expressed her displeasure at the lack of representation of Blacks and others and chastised the organizers. “We have been here fighting the government face-to-face. We’ve been flipping the script completely.” Bishop Bernadel Jefferson agreed. “We were left out of meetings and solutions. You can assume to know what we need but you don’t,” said Jefferson, pastor of Faith Deliverance Center in Flint and a plaintiff in a lawsuit that challenges the state’s emergency manager law. Bishop Jefferson and Ms. Deloney said residents and activists continue to agitate in Detroit, Lansing and elsewhere in the state on the city’s behalf and continue to push for accountability from Snyder and other state, county and city officials who have refused to take responsibility for the man-made public health crisis. When Gov. Snyder authorized Emergency Manager Darnell Early to switch Flint’s drinking water from the clean, fresh water of Lake Huron to the foul, dirty and corrosive Flint River in 2014, residents began complaining about the foul taste and color of their drinking water but the governor, his former spokesman, state and city officials, dismissive of the chorus of complaints, continued to insist that the water was safe to drink. Since then, the move—made ostensibly to save money—has left Flint residents to deal with the long-term consequences and fallout from a lead poisoning tragedy that could affect them and their children into the foreseeable future. Problems associated with exposure to lead are irreversible. Lead is a potent neurotoxin which can cause memory loss, irreversible brain damage, impaired development, cognitive dysfunction, speech impediments and other serious chronic conditions, particularly in children.